Executive Acres, oil / mixed media on panel - Dimensions: 24 7/8" x 32" x 1 3/4"
I usually don’t know what a work is about until I’m done with it and have it titled. I concentrate on design, composition, color, texture. I view it in all directions. I turn it upside, sideways and back up again, checking to see that I have a good composition. I feel that if one has a good composition the painting will work in any direction. Of course, I eventually have to settle on a direction that I think works best – or that I like the best. Then, I’ll start studying the painting to see what I “see” in it. 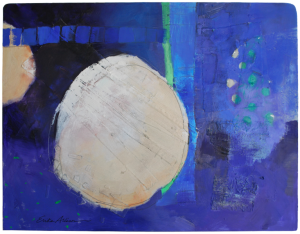 Abstract work invites the viewer (including the artist) to see what he/she sees in it. Different viewers can see different things. Eventually, something will hit me, a title will come to mind and I’ll know I’m finished. In this painting I felt like I was seeing outer space. Maybe planets, asteroids, the unknown. And, there’s all this talk about space travel, the new frontier, etc. Private companies are talking about trips into space. And, of course,only the very wealthy will be able to afford this kind of adventure. I’m thinking maybe a home on a new planet takes the place of the big house on the hill. But, then, you may see something altogether different. One of my artist friends sees a moon pie! She’s from the south, in case you couldn’t guess! This original oil/mixed media painting can be seen at R Space Studio in The Arts Factory, 107 E. Charleston Blvd, Ste. 125, Las Vegas NV through February. Mixed Media – What?, Why? ©2009 - 2019. Erika Allison. All rights reserved.